I am a food idiot. I honestly don't think about food much. I could attribute this to my fortune in always having enough to eat, but that wouldn't be the whole story. Really, I'm just clueless when it comes to food. Therefore, in my years since graduating college I've only had one food epiphany: I can go buy whatever I want whenever I want and eat it... for example, bacon. Now, thanks to my new gardening hobby, I've had my second food epiphany ever. Ready? It's Earth-shattering I tell you. I can grow whatever I want so I don't even have to buy it to eat it. And it's basically free and doesn't require any driving. It's like magic! 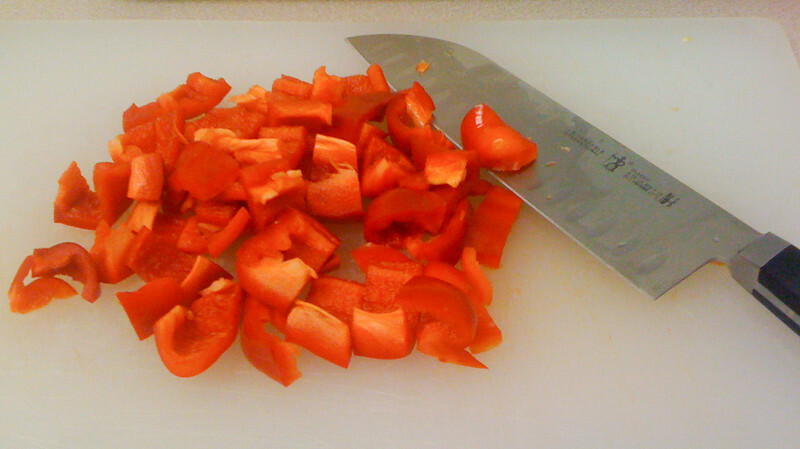 So for my first magical experience, one of my favorite vegetables (even though it's a fruit), red bell peppers! 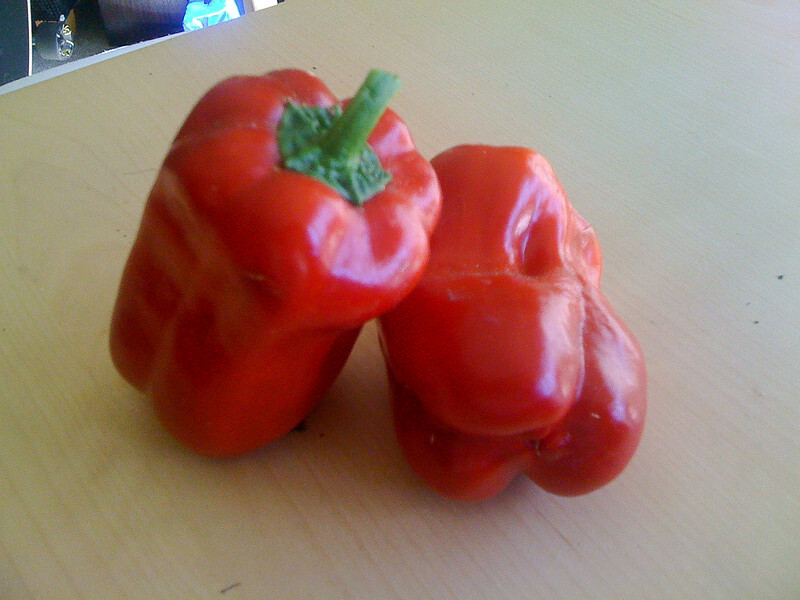 Diana bought me a cute little pepper plant from a farmers' market and it sprouted two very cute peppers. Did you know that red bell peppers are just green ones that you procrastinate harvesting for a really long time? It's perfect for me! They were so heavy they bent the plant over and grew on the ground. The plant must have been relieved when I snipped them off (it did spring back upright just a bit). Then I chopped them up using the fantastic new knife Will got me. I threw them in with some Costco frozen vegetables (okay so I'm lazy). 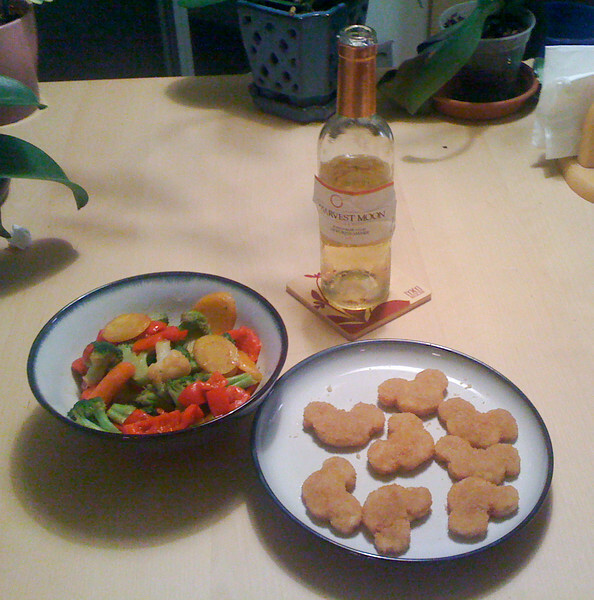 And voila, dinner of champions complete with Costco Mickey Mouse chicken nuggets and Gewürztraminer! Very very classy. As an interesting aside, I just noticed that this meal was brought to me by a lot of the most wonderful people in my life. 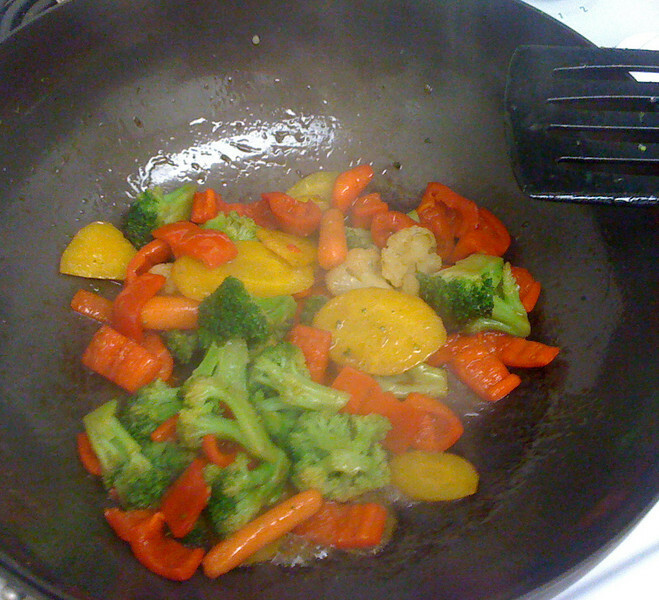 The bell pepper plant was given to me by my dearest Diana who also introduced me to the Costco Mickey Mouse nuggets and Costco frozen veggies (and "Costco cooking" in general), the knife was from Will, the stir frying know-how from my dad, and the Gewürztraminer from either Matt and Maricia or Will and Lauren. Thanks everyone! The first part of Day 3 was really really crazy. First some background. I'm used to riding dainty thoroughbreds who are built for speed, like a Porsche for example. They have dainty little bones and dainty little hooves, and ginormous muscles. They also make high-strung cats seem relaxed by comparison. 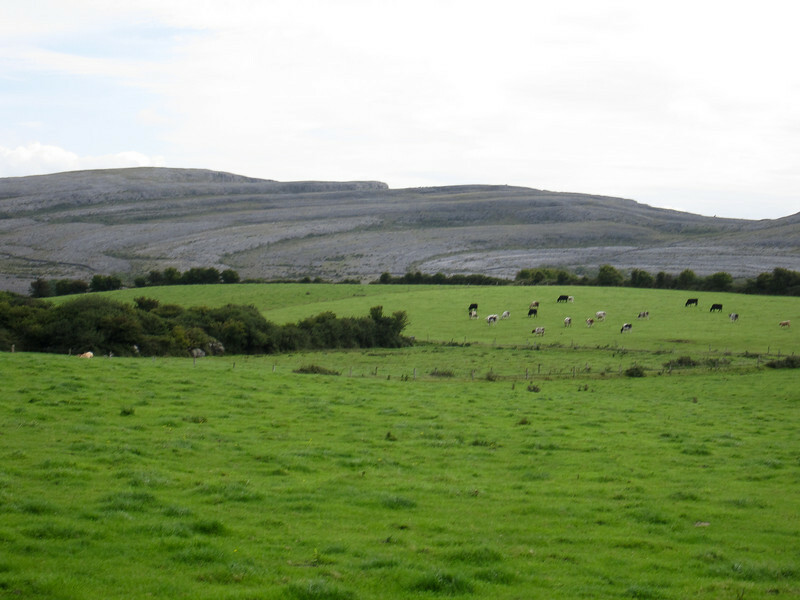 Imagine how far my eyes bulged out when we show up at the first hill going up towards The Burren and start doing some serious bog stomping, boulder scrambling, and trailblazing on our horses and none of them even bats an eye (or snaps a leg for that matter). We were knee deep in swamp one moment and knocking rocks off the side of the hill the next. And finally, we get to the top and there's an alter-like slab of raw limestone jutting out the hillside marking our accomplishment. I'd never felt quite so adventurous in my life -- it was everything I could do not to start humming the Lord of the Rings theme. Okay, maybe I did do that ... later. 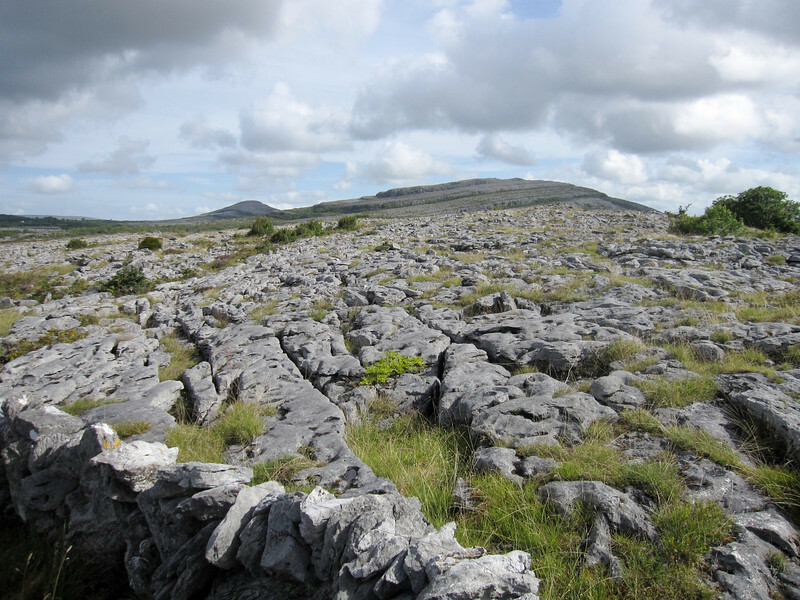 You may have noticed that the surface of The Burren is crisscrossed by rather deep fissures. I didn't really think much of it until our host, Nicola, stopped us at lunch just before I was about to go find a bush to stand by (if you know what I mean) and casually mentioned that "Oh, if you wander off be careful, it's dangerous out there." I looked around and only saw soft grass. "The grass grows up from the deep sharp fissures in between the rocks so you can't tell where the cracks are." Yeah, and the grass also grows on top of the rocks and around the rocks and everything looks the same. It didn't help that there were few bushes and that I had to really do some hiking to find privacy. It was nerve-wracking never knowing if after my next step would leave me stuck in the ground, legs bleeding, with my pants down and worse yet, having to explain that to someone (assuming anyone ever found me). Luckily, things turned out okay. The afternoon proved much less adventurous as we traveled along ordinary roads. In fact, I got a bit bored here as our goal was to cross two hills so that we could cross two more hills the day after and come to the ocean. 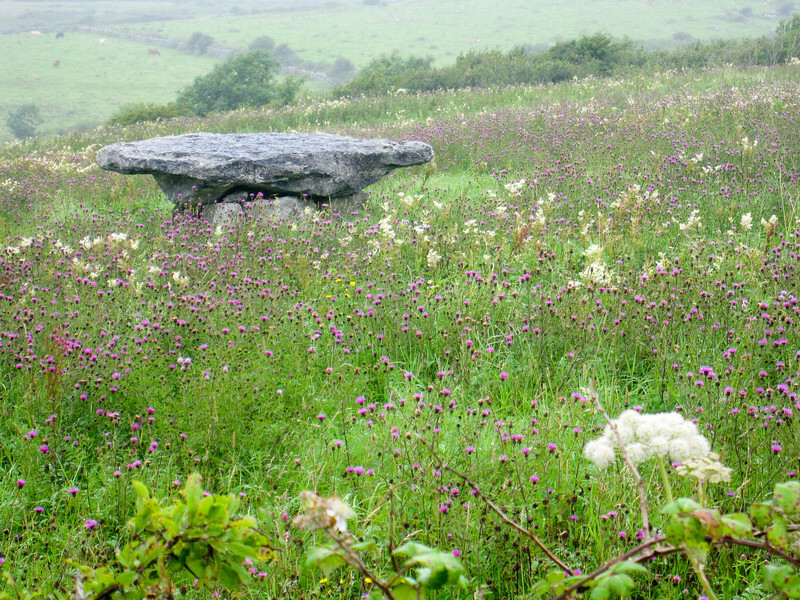 We started talking about how the tour itinerary promised us dolmens and we hadn't seen any, so Kiki showed us this one. It wasn't until after we had all whipped out our cameras and started snapping away that Kiki laughed and told us that it was only 20 years old and some farmer built it for fun. Sigh. 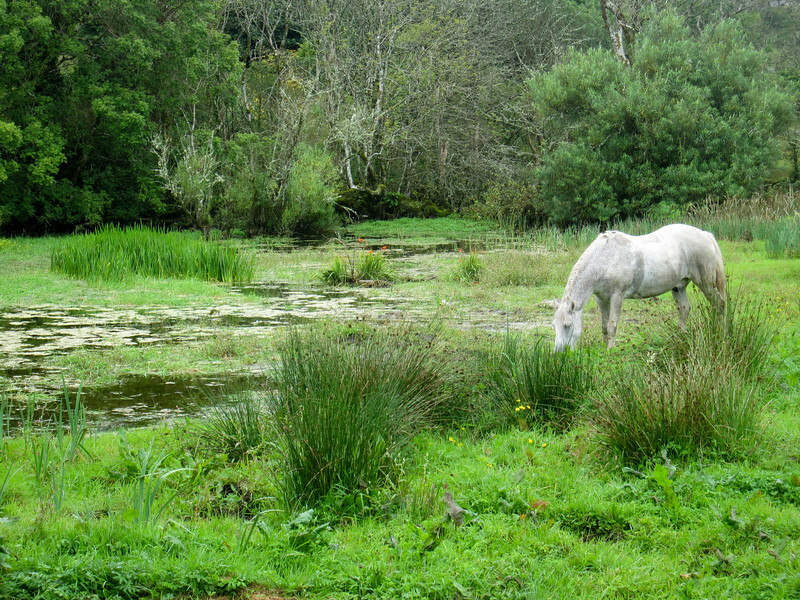 After a while we finally parked our horsies in yet another ridiculously picturesque spot (sure beats the horse-poo-filled patches of dirt where I'm used to parking my horse here). 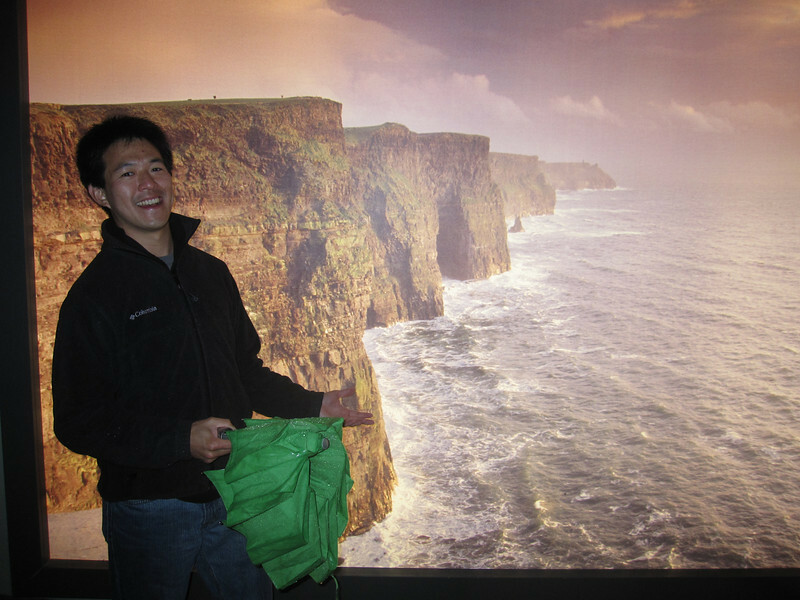 In the evening, we headed out by bus to the Cliffs of Moher, which I had wanted to see my last visit to Ireland but never made it. I made it this time -- in driving wind and rain. No matter! It was worth it. 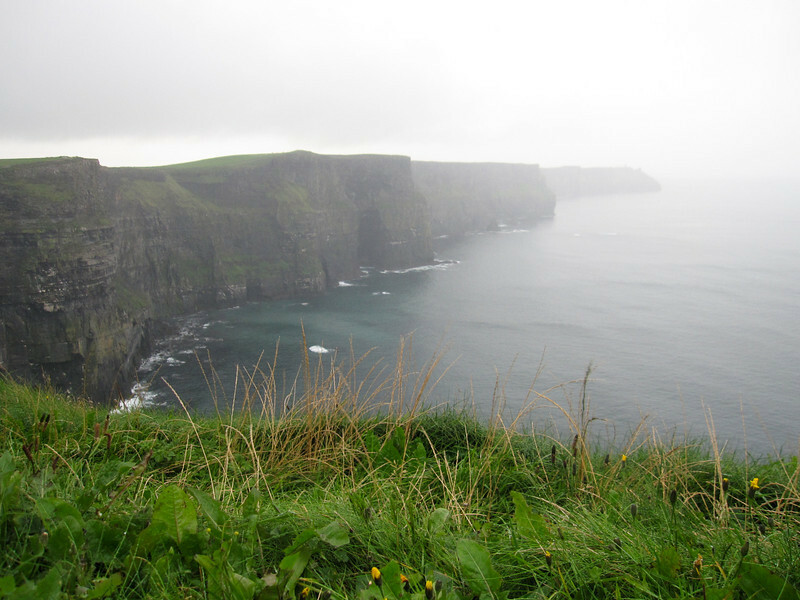 It's eerily beautiful how the gentle grassy slope dotted with cattle slowly rises along the horizon until it crashes abruptly into the ocean in these majestic cliffs. Of course, not wanting to be outdone by the weather, we took shelter inside the museum nearby and pretended it was a bright and sunny outside to take our minds off our cold dripping clothes. The museum happily accommodated our delusion. And of course, we finished the evening off with a pint of Guinness as always. Here's a video I put together for our third day. Unfortunately there isn't any footage of the crazy morning adventure because, well, I was busy adventuring. I picked Duncan up from A Dog's Life (kennel) and they handed me this. KAWAII DESU NE???? ?